Sun, fun, fireworks and beer-everyone loves 4th of July! Everyone except for your dog, that is. 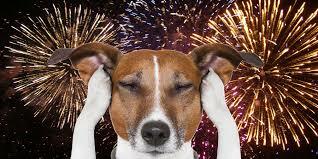 The noise and commotion that accompany the 4th of July festivities can be extremely stressful for pets and unfortunately July 3rd-5th is one of the busiest times of the year for shelters. Here are a few tips to help keep your pup safe and happy this holiday! Tire them out- before the festivities begin take your dog for a long walk or swim, play a good game of fetch, or here’s an idea- bring them to Lucky Dog Bark and Brew! Provide distractions- long lasting chew toys such as antlers are great! You can also try a peanut butter filled Kong toy-they last even longer if they’re frozen! We carry a lot of awesome products at our Lucky Dog CLT boutique! Give them a “safe place”- a safe and comfortable place to rest can make all the difference! Designate a “safe spot” in your home and try playing music or leaving the TV on to help drown out the sound of fireworks. Make sure their tags and microchips are up to date- IF your dog happens to get loose, you are much more likely to be reunited with them if you are easy to contact. It only takes a few minutes to have a new tag made or update your dog’s microchip information. Leave them at home- we know you have the best of intentions when you take your dog with you, but this is one of those times when its probably best to leave them behind. They may miss out on the party, but you’ll save them a lot of stress this way too. If you do decide to bring your dog along, we have safe indoor play yards where you can allow your dog to run off leash without the risk!